Labels are the basic organizational tool of Gmail, they're like folders except you can assign an email to as many labels as you want. Because Google gives you so much free storage space (more than 10 GB and counting), you don't need to delete incoming emails to conserve space. Instead you can file each email away by labeling and archiving it. This will give you an organized, searchable database of every email you've ever sent or received since you made the switch to Gmail. An organized email database is invaluable when you're trying to track down a conversation and pick up where you left off with an old client, look up a forgotten password, or redownload a previously emailed file. Give labels a hierarchy by nesting related labels under a common parent label. Go to the 'Labels' tab under Gmail's Settings and only show labels that you want to have readily available in Gmail's sidebar. You can hide any labels that you don't use every day. Multiple inboxes (L) allows you to have up to five additional inboxes based on different search queries. These different search queries can be anything from a certain label to emails from a certain email address like @whereyouwork.com. You could use multiple inboxes, for example, to display emails labeled 'Needs Response' and 'Awaiting Response' to the right of your main inbox so that a single glance at your Gmail tells you exactly what has to be done and what you should be expecting. In 2011, 19% of emails that made it into corporate inboxes were spam, despite the use of spam filters. While you might not get quite that many, it's likely that you're getting a fair amount of email that you'd rather not be getting or would like to have automatically organized and filed away. That's where email filtering comes in. 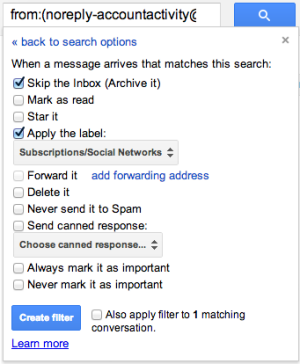 1) Go to Gmail Settings, then click on the 'Filters' tab, and then click on "Create a new filter" at the bottom. 2) While you're looking at an individual email, click 'More' and then "Filter messages like these." For example, I like to filter all my social media and subscription emails from services like Facebook, Twitter, LinkedIn, and Groupon so that they skip my inbox and are put into my 'Subscriptions/Social Networks' label. That way, I can check that label at the end of any day and see who followed me on Twitter, updated their LinkedIn profile or what daily deals are going on. Filters are a really easy way to drastically reduce the amount of email that makes it to your inbox and interrupt your productivity. There is one neat feature of Gmail however, that makes filters really effective at analyzing and determining who is spamming you. Let's say your email address is "HanSolo@gmail.com", anything sent to "Han.Solo@gmail.com", "H.anSolo@gmail.com", or "H.a.n.S.o.l.o@gmail.com" will all get sent to your same "HanSolo@gmail.com" inbox. Additionally, you can use a "+" to add any text to your email address and have it go to the same @gmail account. For example, "HanSolo+MillenniumFalcon@gmail.com" will be sent to HanSolo@gmail.com. By combining this functionality with filters you can keep your inbox much more organized and track down who is spamming you. Simply establish a few guidelines like giving out the address "Han.Solo@gmail.com" for work, "HanSolo@gmail.com" for friends and family and "HanSolo+PizzaHut@gmail.com" for specials from Pizza Hut (for example). All these emails will go to the same inbox, but by setting up filters, you'll be able to quickly sort out emails sent from any one source. If you're like most people, you have more than one email account. Gmail makes it very easy to combine all your email accounts into your Gmail account and still send from each one of them. Go to 'Settings->Accounts and Import' and choose either 'Send mail from another address' or 'Add POP3 email account. Heavy computer users know that keyboard shortcuts can save a ton of time when used correctly. Gmail has its own set of keyboard shortcuts that can make going through and organizing a long list of emails as easy as a few keystrokes. To enable keyboard shortcuts, go to Gmail's Settings and then choose "Keyboard shortcuts on." 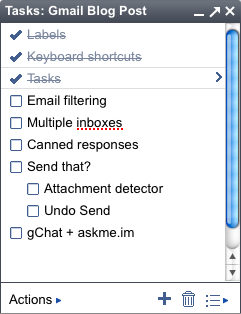 New users of Gmail keyboard shortcuts however can simply press "?" in Gmail to see a list of all the keyboard shortcuts. You can also check out a list online or download a PDF of the shortcuts. If you really want to dedicate yourself to learning the Gmail keyboard shortcuts and you're using the Chrome browser, you can install KeyRocket for Gmail, which will let you know the keyboard shortcut for any action that you do with your mouse in Gmail. Grouping emails into a single to-do list. It is worth mentioning that Remember The Milk, a popular task and to-do list manager, has both a Gmail browser add-on and a gadget in Gmail labs that replicate many of the functionalities of Tasks. 2) Once there's nothing left in your inbox, go to your Starred folder (gs) and work through each item one at a time. 3) Go back to your inbox (gi), rinse and repeat. Unread message icon (L) may seem like a tiny change but can make a big difference in how often you check your email. Instead of simply showing the number of unread emails in the title bar of your tab (i.e. "Inbox (8) - youremail@gmail.com"), it also shows the number of unread messages in the tab's favicon. For those of you who use a ton of tabs and might not be able to see the full title tag, this is a great way to not have to switch over to Gmail more often than you need to in order to check to see if you have any mail. 5) Send & Archive can save several keystrokes on every sent email. One of the easiest ways to keep your email clean is to enable Send & Archive (L), which automatically archives an email after you click send and brings you back to your inbox instead of just sending it and waiting for you to make the next move. For those of you who find yourselves archiving most of your emails after you send them, this simple lab can save you several minutes everyday. Canned responses (L) are extremely helpful and timesaving for those people who answer the same questions or send the same responses several times a day. 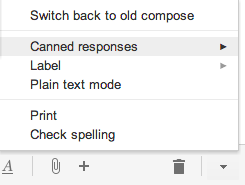 To create a canned response, simply enable the feature in Gmail's labs and when writing an email, click the 'More options' arrow in the lower right-hand corner and then go to Canned responses. Canned responses can also, if coupled with filters, be used to create custom auto-responses based on the content of the email or who is sending it. For example, if you're out of the office, you can send out one response for emails sent to your home email address, another auto-reply for emails sent to your work address, and a specific response for emails about an important project you're working on to indicate another person to contact. Background Send (L) is a simple Lab that takes you back to your inbox when you click send and let's you move on to your next task in Gmail while the email sends in the background. You'll never again have to wait for Gmail to fully process the email sending and Gmail will show an 'Email Sent' notification at the top of your inbox once the email has actually been sent. Undo Send (L) delays sending an email for 5, 10, 20 or 30 seconds when 'Sent' is clicked and displays a message at the top of the screen that allows you to stop the email from sending. It sounds simple but this gives you a chance to take back an email that you immediately regret sending like when you've forgotten to attach a file or emailed your friend to let her know how excited you are about her surprise party. I hate having to print, sign and scan a document that've been emailed to me. It's bad for the environment and time consuming. HelloSign is a fantastic Gmail add-on that allows you to easily fill out forms right in your inbox. HelloSign gives you the ability to save a signature, check boxes, add dates and write text on top of files you've received. Once you set up HelloSign, when you receive a file you'll see a "Sign" option to the right of the options to View and Download the file. When you click Sign, all you have to do is click the Signature button, select your saved signature and drag it to the appropriate place on the document. You can then save the signed file and email it back to the original sender. HelloSign also has an iPhone and iPad app that synchs nicely with your Gmail HelloSign account! For email power users, Priority Inbox is a dream come true. It automatically goes through your incoming email and filters it by importance so that you see the most crucial emails at the top of your inbox. The best part of Priority Inbox however, is that if it makes a mistake, you can mark a message as "less important" or "more important" and it will continually improve its filtering system. Because it takes a little time before Priority Inbox figures out your habits, it's important to commit to using it for a week or so before determining whether you like it or not. To enable Priority Inbox, simply go to 'Settings->Priority Inbox'. Rapportive is a simple social CRM built into Gmail for Firefox, Safari and Chrome. It replaces the ads in the sidebar of your Gmail with a snapshot of the person you're emailing by showing their social media profiles like Twitter, Facebook and LinkedIn. This gives you an extremely easy way to get a better, more real picture of the person you're emailing and allow you to connect with them on a more personal level. You can take a quick peek at their Facebook interests and last few Tweets, for example, and see if you have anything unexpected in common. You also will often get a picture of them through one of their connected social media accounts, which can be very helpful if you schedule a meeting at a coffee shop and need to locate them in a crowd. The service also lets you leave private notes so that you can keep records and improve your emailing relationship with individual contacts in the future. For example, if someone emails you with her username or account name and password to your service, you can enter in that information so that you won't have to ask for it the next time. To install Rapportive, simply go to Rapportive.com and click install. It's a relatively new service so it's always improving it's features. Streak is a great and feature-packed tool that let's you keep track of your customers, manage email support and handle dealflow inside Gmail. 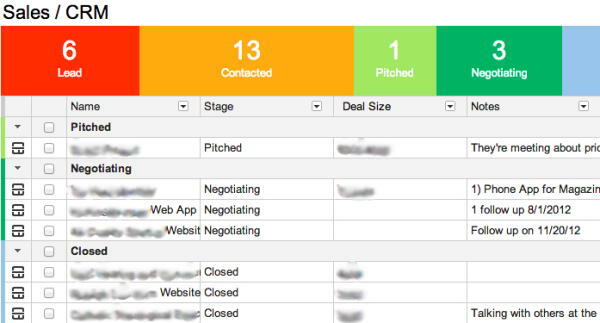 Streak organizes your related emails into 'Boxes' and you can label each Box to indicate which stage of the support or sales process you're in with that specific customer. I use it to keep track of Sales leads so that I can group together all my conversations with a particular contact and easily remember the last time I followed up with him or her. Some of the above features are still in Gmail labs, meaning they are not yet official features and are subject to termination at any time. These features have been labeled with "(L)". To turn on and enable a labs feature, log into your Gmail account, go to Settings -> Labs, find the desired lab and choose 'Enable'. 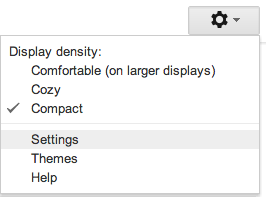 How else are you all using Gmail to increase efficiency and stay organized at work? What did I miss? Have any questions? Let me know in the comments! Thanks Lenny, I'm glad you found it helpful! Great post. I've enjoyed using Rapportive, but several of these tips were new to me. Thanks for sharing. I have a problem. I created labels for my e-mails but the e-mail from sent folder, when I choose the label are visible as "me" not as the address I sent the e-mail to... Quite often I sent the same e-mail to many people and all those e-mails are within the same label. How can I change gmail setting so I can see within the label who I sent it to? I have a problem: Gmail thread emails with the same subject which are not related (from different people etc.) I would like to disable this. I love the idea of labels over folders - mainly because you can have more than one. This give you great flexibility to slice and dice your inbox and is great for someone like me that has lots of projects going concurrently. My issue is the only way I have found to assign labels is to pick them out of the list, or use the keyboard shortcuts to search for them. Nice tips. but i have one small problem about layout of gmail. I am using update gmail layout. I want to organize chat panel on right side ? @Pavan: There is a Gmail Lab called Right-side chat that you can enable by going to Settings -> Labs, find the "Right-side chat" lab and choose 'Enable'.